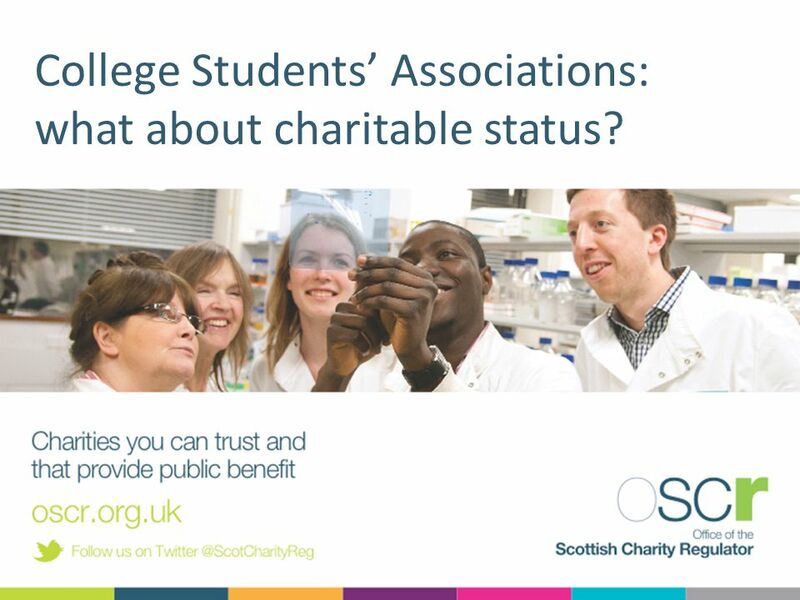 College Students’ Associations: what about charitable status? 1 College Students’ Associations: what about charitable status? 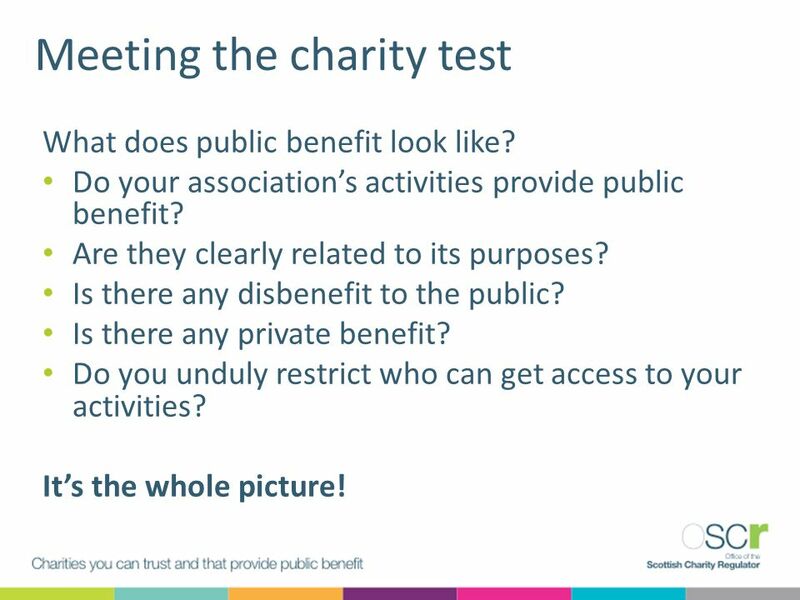 6 Meeting the charity test What does public benefit look like? 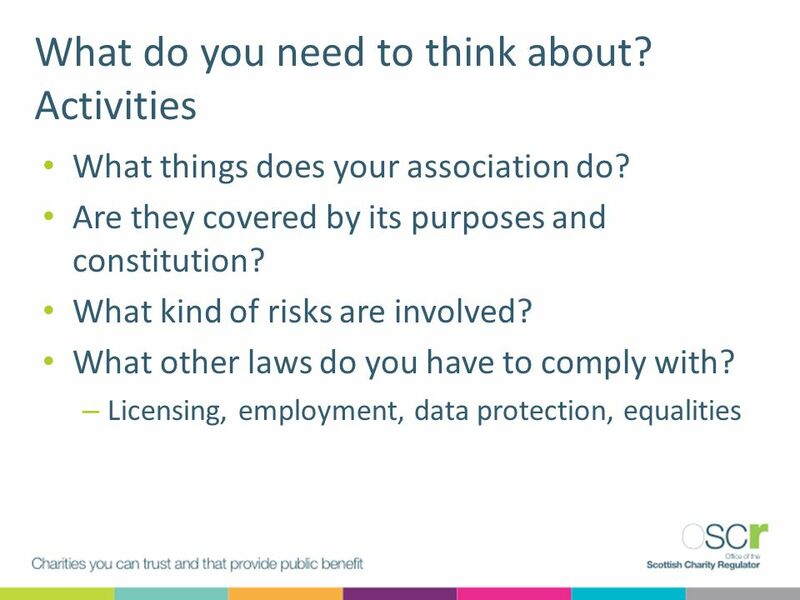 Do your association’s activities provide public benefit? Are they clearly related to its purposes? Is there any disbenefit to the public? Is there any private benefit? Do you unduly restrict who can get access to your activities? It’s the whole picture! 7 What do you need to think about? 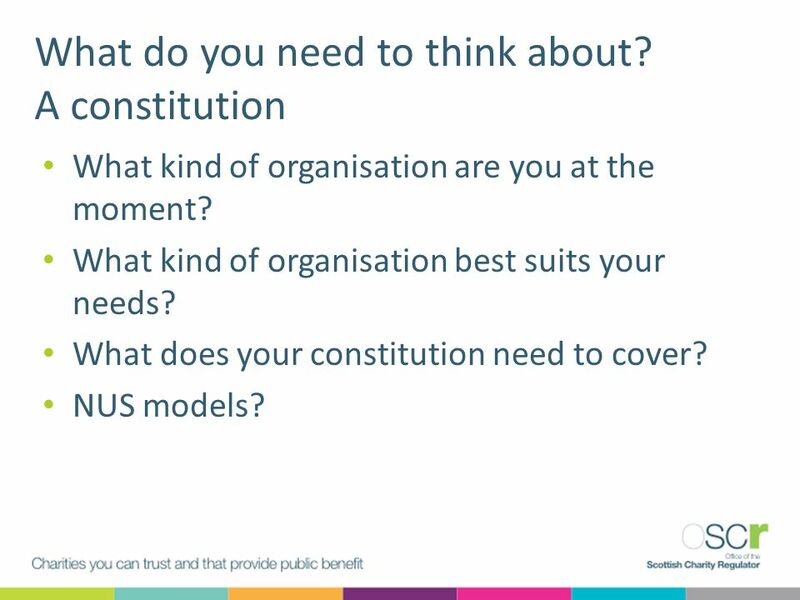 A constitution What kind of organisation are you at the moment? What kind of organisation best suits your needs? What does your constitution need to cover? NUS models? 8 What do you need to think about? 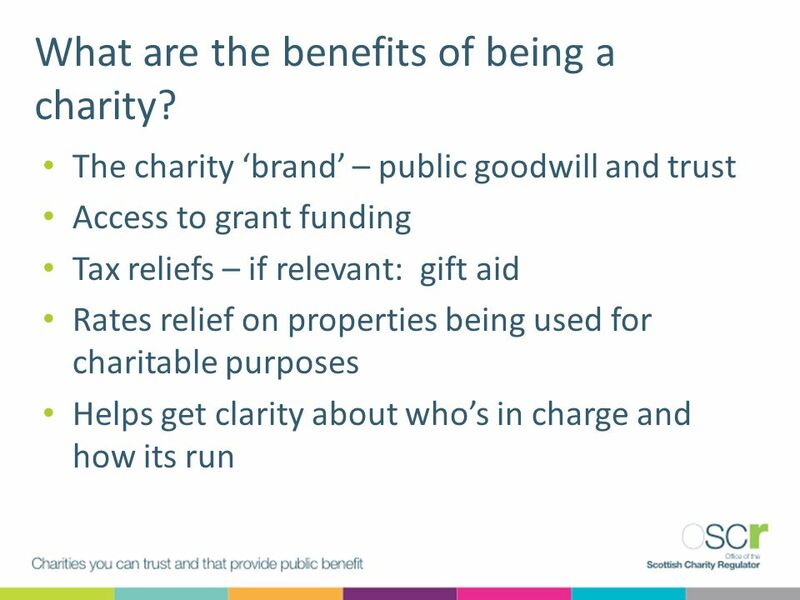 Assets If your association becomes a charity its assets are charitable assets, and are protected What kind of assets will it have? Buildings? Equipment? cash? 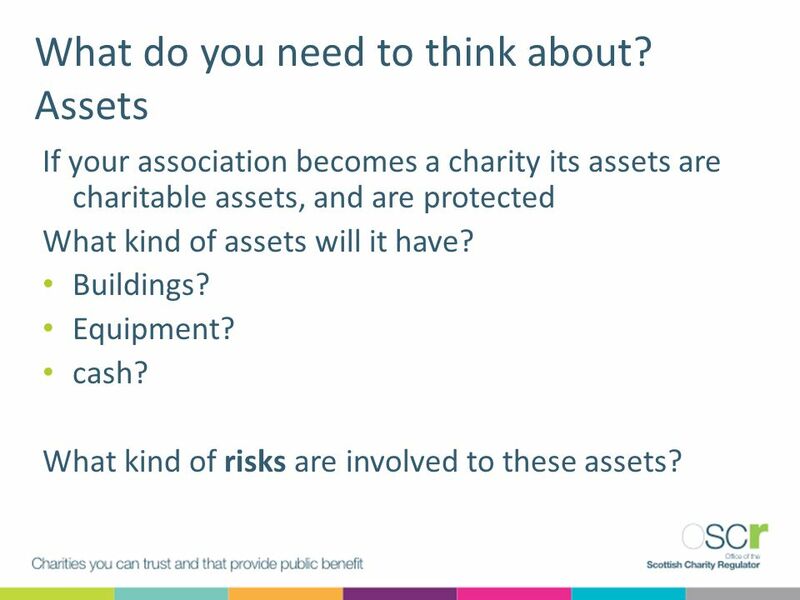 What kind of risks are involved to these assets? 10 What do you need to think about? 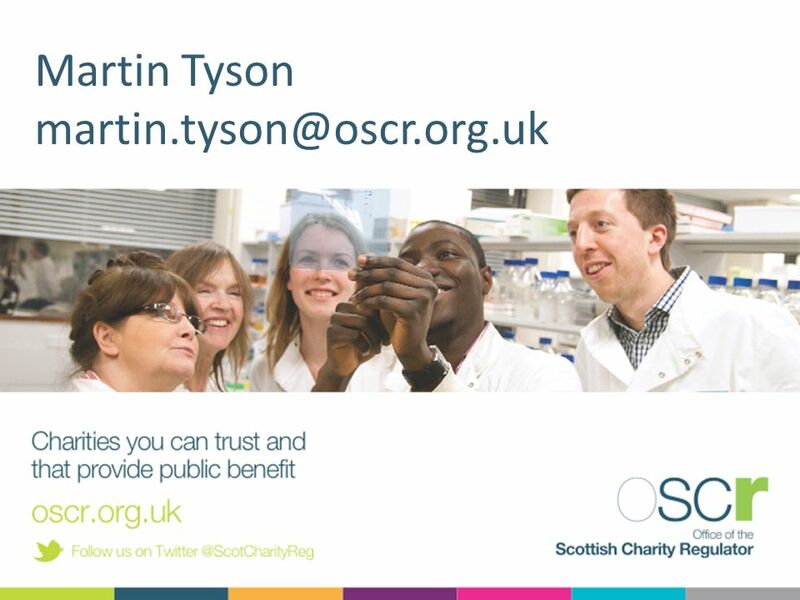 Charity trustees Charity trustees are the people in general management and control of a charity. 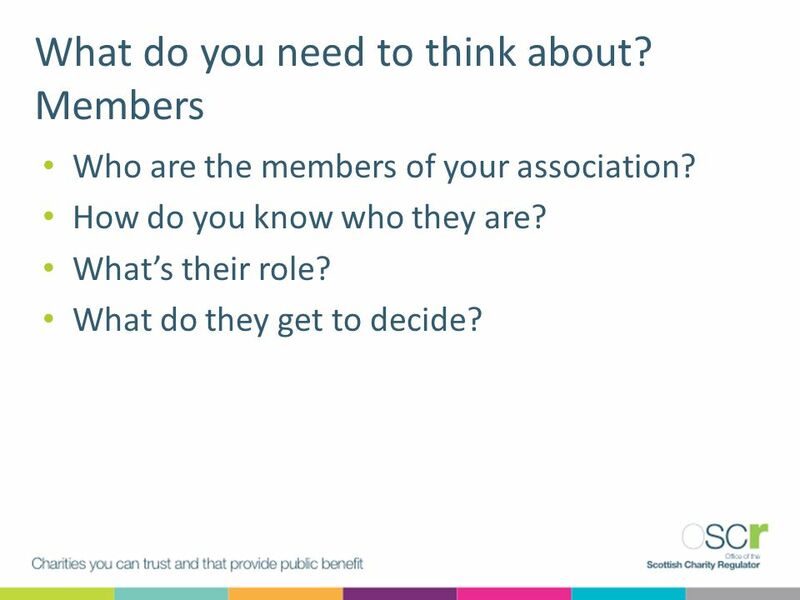 Who are the people currently in charge of your association? Is this the way it ought to be? Have you got the right mix of people? Do they have the right skills? If not, where do you get those skills from? 12 What do you need to think about? 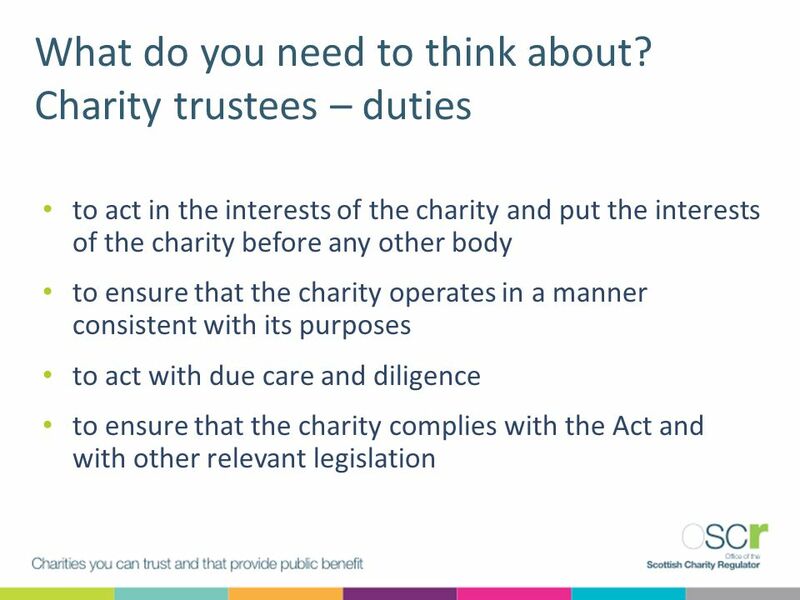 Charity trustees – duties the four general duties of charity trustees? 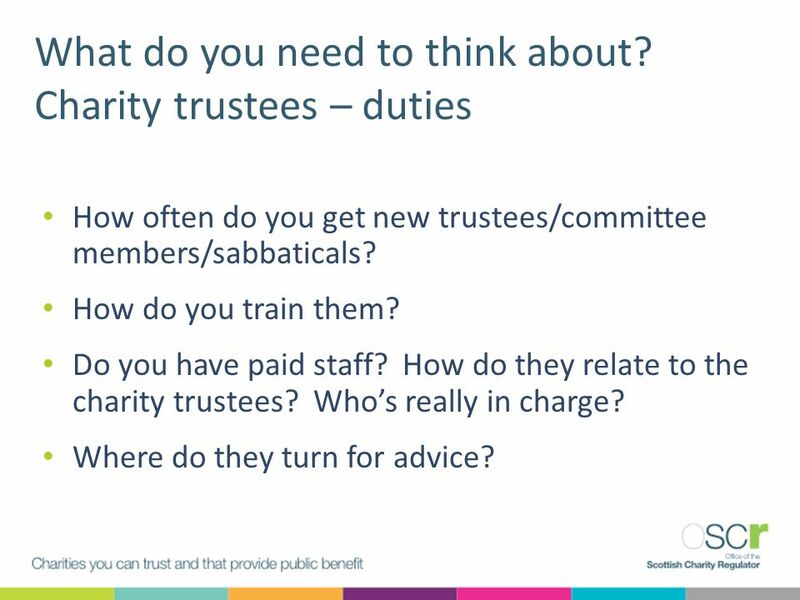 How often do you get new trustees/committee members/sabbaticals? How do you train them? Do you have paid staff? 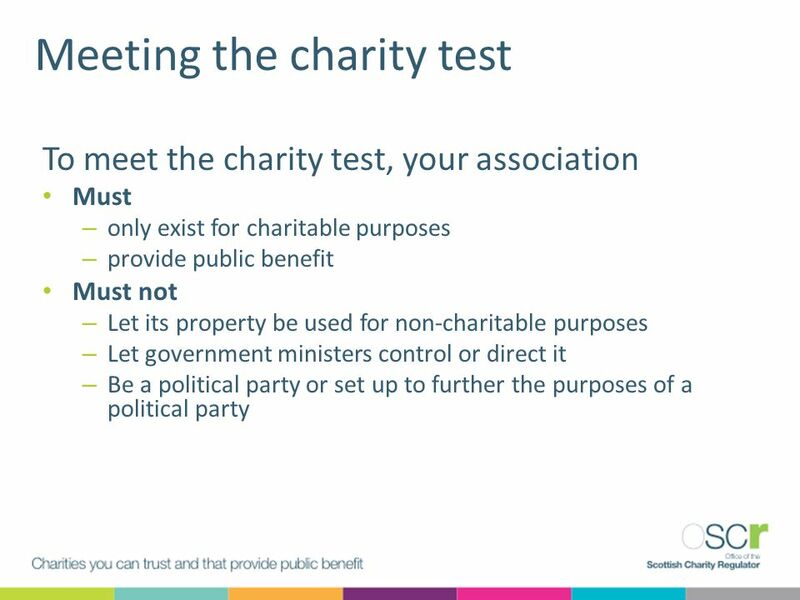 How do they relate to the charity trustees? Who’s really in charge? Where do they turn for advice? 13 What do you need to think about? Members Who are the members of your association? How do you know who they are? What’s their role? What do they get to decide? 14 What do you need to think about? 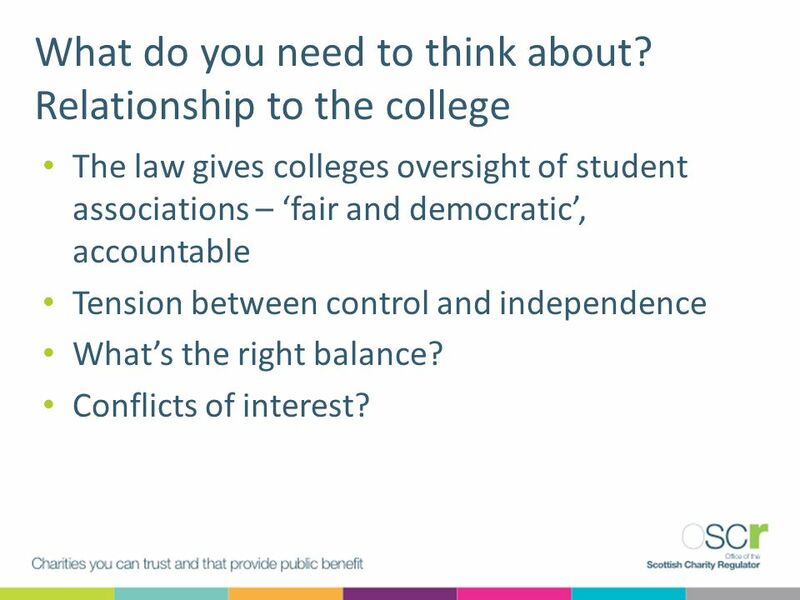 Relationship to the college The law gives colleges oversight of student associations – ‘fair and democratic’, accountable Tension between control and independence What’s the right balance? Conflicts of interest? 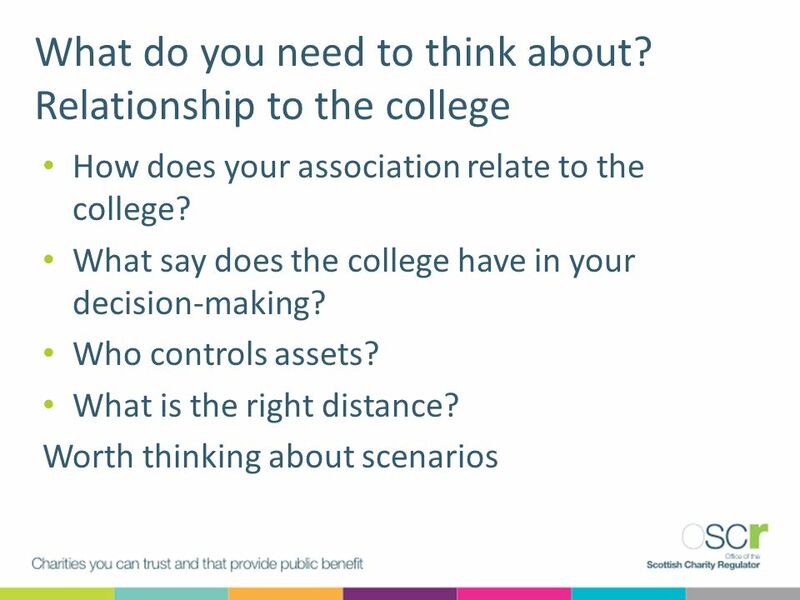 Download ppt "College Students’ Associations: what about charitable status?" Private & Confidential. Not for distribution. ©DWF LLP Title needs degree sign (°) added from the Insert/Symbol menu. This needs to. Workshop C Partnerships for the Future Chaired by Sarah Kirkwood Director of Governance and Nursing Nottingham CityCare Partnership. 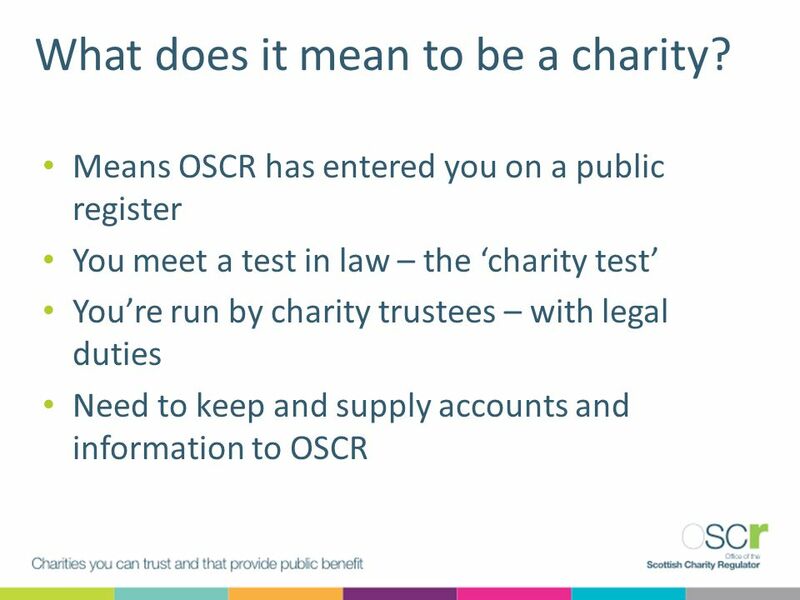 Charity Law Reform Alma Clissmann Law Reform Committee Law Society. Facilitated by: Pobal Training Initiative.  Using the “Managing Better” Toolkit  Principles of Good Governance  Key Responsibilities of the Company. 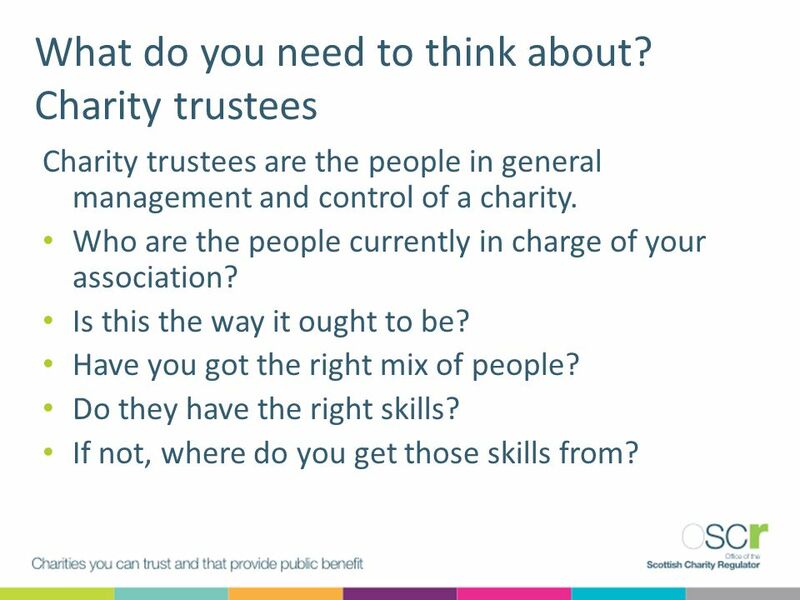 What’s Fundraising got to do with Trustees?. Why is fundraising a core concern? It gives your organisation the means to: Deliver essential resources Plan. Introduction to the Community Cashback Agreement. Add client logo Elliot Harris FCA DChA Charities Partner Trustees - The Roles, Responsibilities and Challenges a presentation. GIBRALTAR PHILANTHROPY FORUM TAX AND LEGAL ISSUES RELATING TO INTERNATIONAL GIVING OWEN CLUTTON 19 NOVEMBER 2013. Voluntary Action Scotland Conference 2012 Lisa McGhee Acting Development Manager. CODE OF ETHICS South Australian Public Sector Public Sector Act, 2009. Performing a Fiduciary Review of Trust Administration FIRMA April 2009 Independent Fiduciary Services ® Independent Fiduciary Services, Inc.  th. Communitymatters.org.uk. Community Asset Transfer (CAT) Richard Bridge Head of Conusltancy,Training and Quality. 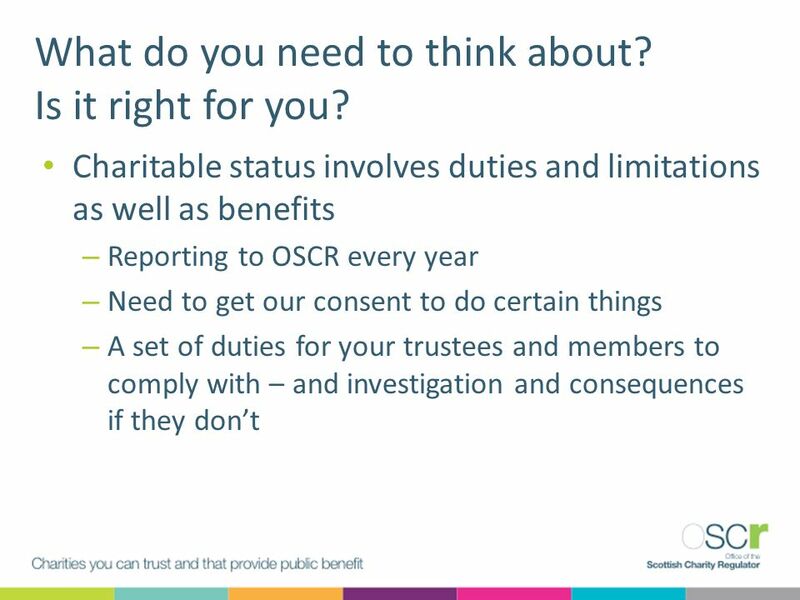 Duties of a Trustee Chris Smail - Langer & Co /02/2011. Presented by NAME TO BE SUPPLIED TITLE TO BE SUPPLIED Scottish Provident Relevant Life Policies Relevant Life Policies.